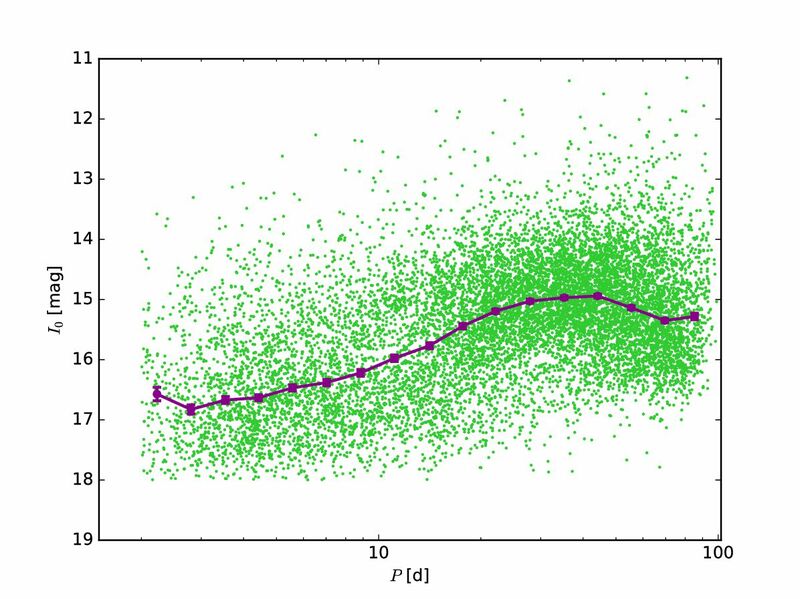 We present the discovery and statistical analysis of 12 660 spotted variable stars toward and inside the Galactic bulge from over two-decade-long Optical Gravitational Lensing Experiment (OGLE) data. 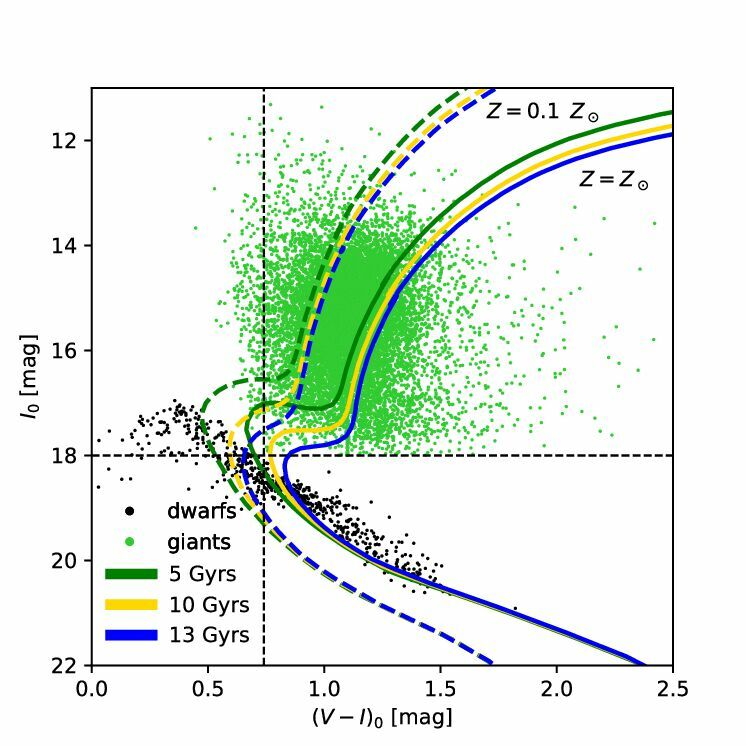 We devise a new method of dereddening of individual stars toward the Galactic bulge where strong and highly nonuniform extinction is present. In effect, 11 812 stars were classified as giants and 848 as dwarfs. 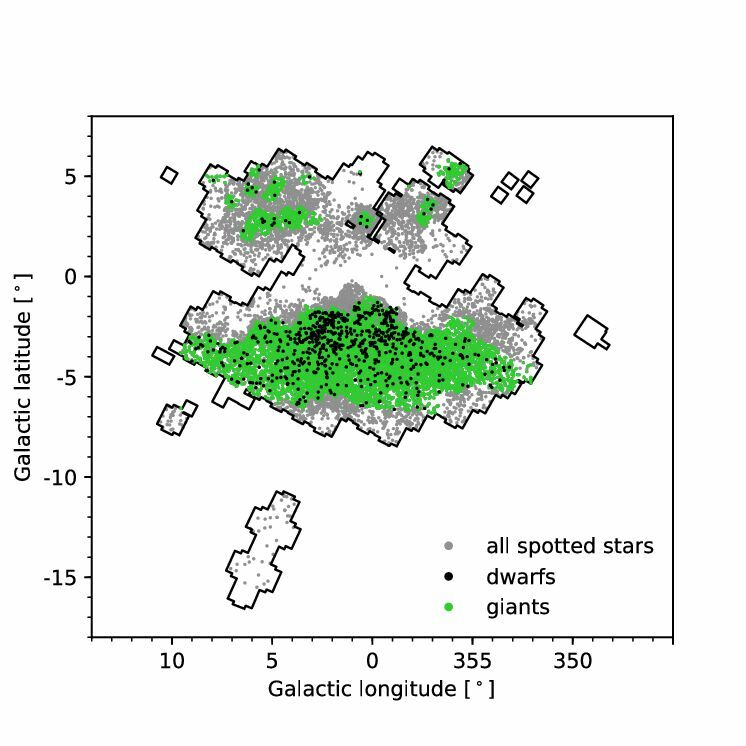 Well defined correlations between the luminosity, variability amplitude and rotation period were found for the giants. 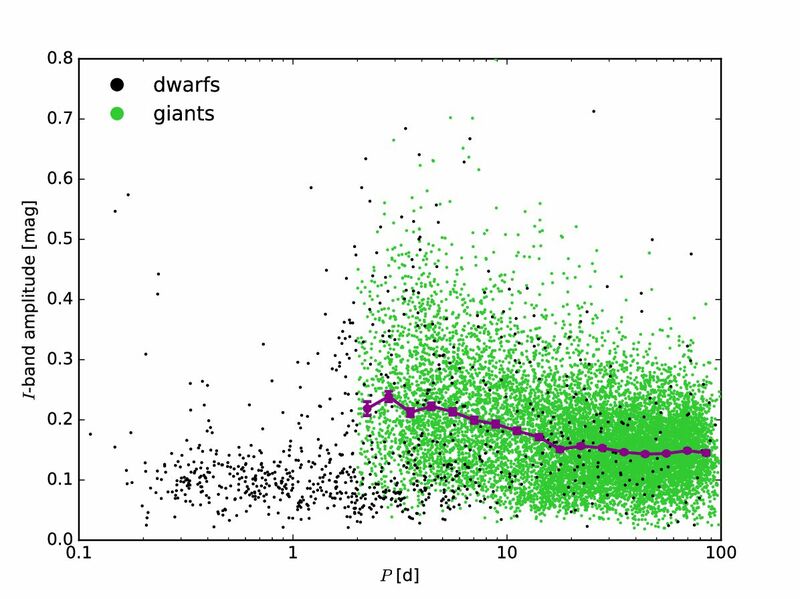 Rapidly rotating dwarfs with periods P≤2 d show I-band amplitudes lower than 0.2 mag which is substantially less than the amplitudes of up to 0.7 mag observed in giants and slowly rotating dwarfs. We also notice that amplitudes of stars brighter than I0≈16 mag do not exceed 0.3-0.4 mag. We divide the stars into three groups characterized by correlation between light and color variations. The positive correlation is characteristic for stars that are cooler when fainter, which results from the variable coverage of the stellar surface with spots similar to the sunspots. 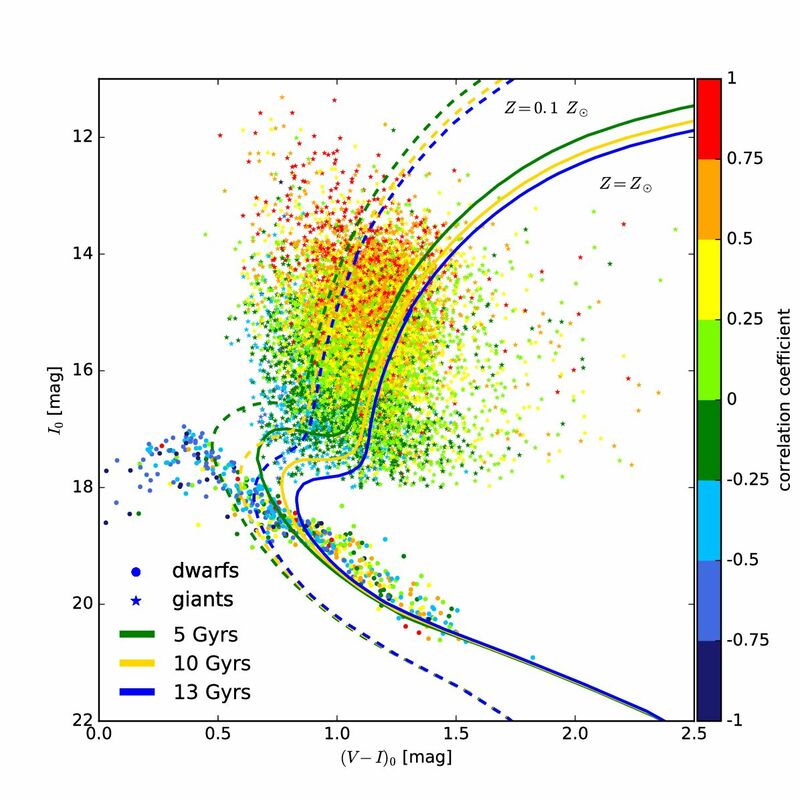 The variability of stars that are cooler when brighter (negative correlation) can be characterized by chemical spots with overabundance of heavy elements inside and variable line-blanketing effect, which is observed in chemically peculiar stars. The null correlation may results from very high level of the magnetic activity with rapidly variable magnetic fields. This division is readily visible on the color-magnitude diagram (CMD), which suggests that it may depend on the radius of the stars. In our collection of spotted stars we detect 79 objects with flares footprints and we discuss briefly their properities. It is important to note that the flare detection efficiency strongly depends on the cadence of the observations. For this reason some of these phenomenons have been missed. Two light curves of stars with flares are presented below. More details can be found in the original paper: arXiv:1903.05651. Please cite this paper when referring to these OGLE results.